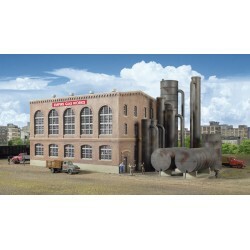 Kit - 16-1/2 x 7-7/8 x 7-7/8"
The Walthers Cornerstone Gas Plant with Washing Tank was a vital structure in the gas works. For over a century, the gas works was a fixture of American cities and towns. Long before natural gas and electricity were common, these facilities generated "coal gas" to power street lamps, home appliances and industrial machinery. The gas was actually a byproduct, made by baking coal to produce coke. Running night and day, a variety of fascinating machinery and structures were needed, along with plenty of rail service. After raw gas was recovered from the coke retorts, it was piped to the Gas Plant for cooling and cleaning. This required several pressurized steel tanks, each handling part of the process. As newer methods of producing and improving the energy output of the gas were introduced, the plant was modernized and larger tanks constructed alongside to handle increased production. Typical of a modernized operation, the new Gas Plant kit is a realistic blend of old and new. 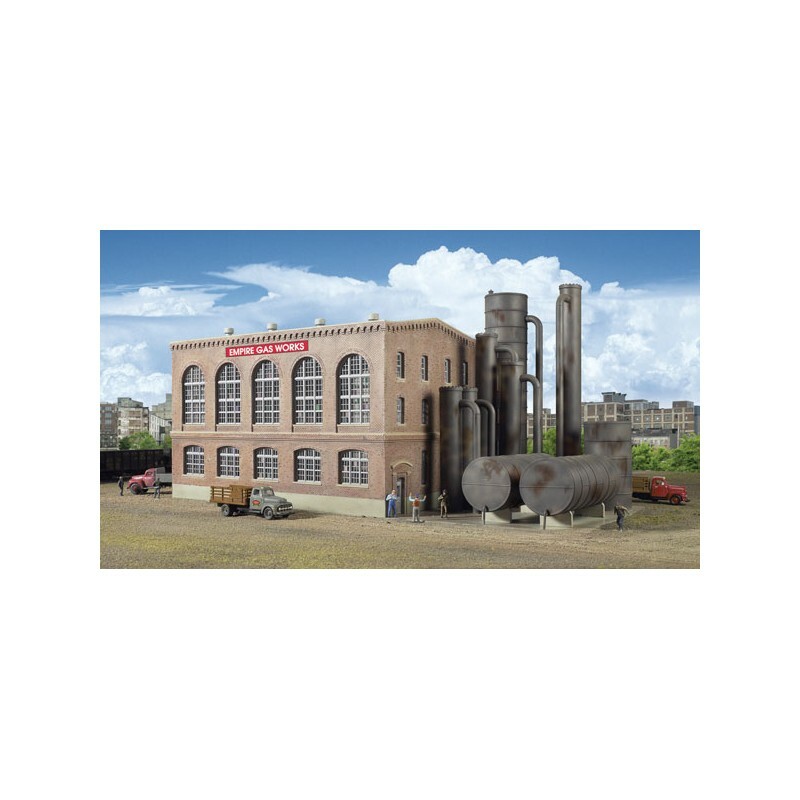 The kit is complete with a large main building featuring excellent brick detailing and older-style arched windows with realistic thin frames. Alongside you'll find a series of steel tanks that give the plant its unique identity and make it a natural addition to other industrial complexes such as steel mills. As shown the Gas Plant measures: 16-1/2 x 7-7/8 x 7-7/8" 41.2 x 19.6 x 19.6cm. The Gas Plant is just one of a wide variety of Cornerstone industrial buildings.